As the spotlight in D.C. continues to shine on Sulaimon Brown, a recently fired auditor at the Department of Health Care Finance, we thought we’d bring you some numbers on the District’s Medicaid spending. 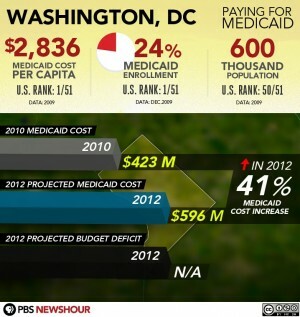 A recent NewsHour PBS photo essay breaks down 2012 Medicaid budgets and 2009 spending for the 50 states and D.C. The District ranked number one in two areas in 2009: Medicaid cost per capita and the percentage of the population enrolled in Medicaid. In other news, Wayne Turnage, who fired Brown last week, was expected to have been confirmed as the director of Health Care Finance. House Republicans prepare to evict struggling DC homeowners: A looming government shutdown on March 4 could harm people having problems keeping up with their mortgage payments. Financial Services Committee Chairman Spencer Bachus (R-Ala.) announced his panel would consider legislation on March 3 that would take an axe to housing programs that have been the last hope of some facing the possibility of foreclosure.